SOMETHING big was needed for our next athletic event. Something for November. Something big and ambitious. Something that makes no sense at all. So, when an email fluttered it’s way into my inbox suggesting that there was 1 day left to register (before the price went up on Nov 1) for an inaugural half marathon – well that was all the incentive needed. Plus — our entry fees go to a worthy cause. What’s not to like? Of course we could do this. 13.1 miles. We never jog more than 3 these days….so why not try the Innaugural Annapolis Half Marathon? 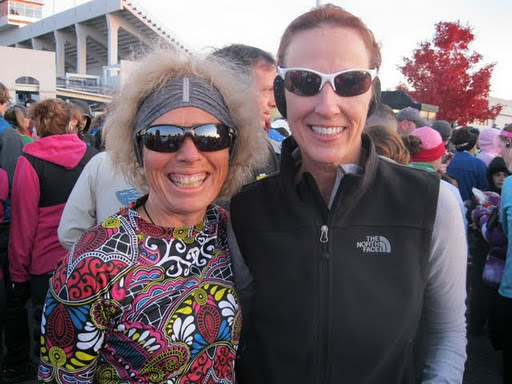 There were several reasons why we (the TriSistaHood) should NOT do this half marathon. The biggest reason might be training (or lack of) – and the second biggest is timing – we only have 3 weeks to train for 13.1 miles. Details schmetails. TriSista Jill had her game face on (i.e. weak moment) — so we signed for this event and proceeded to power-walk / jog like maniacs along the Baltimore promenade 9-11 miles at a pop every weekend. I even attempted to jog along the new ICC pathway…with little success. Our goal was simple. Don’t get hurt. So far so good. 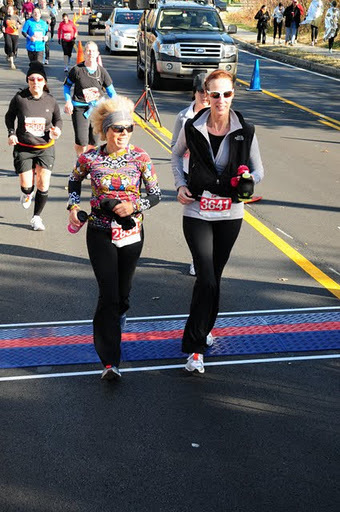 Saturday, November 19, 2011 – event day was a brisk 32 degrees. Trisista Jill (Fluffy) and I arrived a mere 2 hours before everyone else. Jill likes a good parking spot – and by golly we were front row at 5AM. We spent the remaining 2 hours deciding how many layers of clothing to wear, and people watching. People were walking about in the dark with only shorts and t-shirts, while we were bundled in 4-5 layers of clothing inside of a heated car. Jus sayn. By 6:50am, we left the warmth of the car, to stand, hop around, and wait along with a maze of 4000 runners at the start. Collectively shivvering. Thanks to a technical malfunction, the race didn’t get started until 7:20. This gave us a full 30 minutes to acclimate to the freezing temperatures. Finally, the race started, and the crowd began to surge. Once we started running, body temperatures warmed – and it was a perfect day for 13.1 miles. We ran with the big crowd along the narrow roadways, and wondered at what point would we resume our powerwalk/jog pace. We weaved our way through the historic district of Annapolis and made mental notes of cool places (coffee shops, pottery spots, and anything bohemian) we would need to visit some other time. We also changed the channel on the sounds of complaining muscles, and IT band woes. Yes, the terrain was hilly and challenging. Despite our efforts to maintain a pace that we had trained (if you can call it training!) with, there is nothing quite like running with a crowd of runners to keep your pace going faster that you thought you could do. We finished 30 minutes FASTER than our projected finish, and stoked that we accomplished another mind-over-matter athletic event. Plus, we didn’t injure anything in the process! Now…what to do in December….